Why Kindermusik? We offer families a unique opportunity to make music with others and the tools to make music at home! In our rich learning environment, every parent and child can enjoy singing, dancing, and playing music. Kindermusik classes are designed to be age appropriate, so class level is chosen according to the age of your child. If your child is in between age levels, the instructor can help you in determining the right class. The age categories are Foundations, Level 2, Level 3, Level 4, and Level 5. Kindermusik offers three terms throughout the year—fall (August – December), spring (January – May), and summer (June – July). For the fall and spring terms, you can enroll for the full term (all 15 weeks), A Term (the first seven weeks), or B Term (the last eight weeks). You choose what works best for you! Information for each term—start and end dates, class schedules, and fees is posted to our website as soon as it's available—typically two months in advance. New students are encouraged to preview a class before registering. Please check the current semester schedule to see if one is available. Contact the instructor to confirm your date and time availability. We want your child to be in the most appropriate class for them to maximize learning and growth. Make baby’s first class musical! 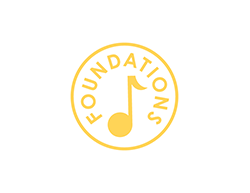 Our Foundations classes offer a sensory-rich yet caring and gentle environment where infants and young toddlers can explore and react to new sounds, sensations, objects, movements. Shared activities for babies and their caregivers provide the opportunity to strengthen your connection with your child through joyful music-making experiences. Our Level 2 classes encourage older toddlers explore their creativity through movement and language. Each class offers plenty of fun outlets for toddler-style energy, promoting cognitive development through singing, dancing, and instrument play. Parents connect with other parents and caregivers who are also experiencing the joys and complexities of these busy years, while learning to use music to create and simplify routines at home. 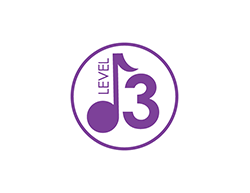 Level 3 classes engage preschoolers’ natural love of music and active imaginations. A wide range of learning opportunities boosts language skills, confidence, independence, social-emotional skills, and self-control. Parents join in at the end of each class, sharing in the joy of music-making while strengthening your relationship with your child. Level 4 classes offer children exciting first experiences with musical symbols and more complex instruments, laying the groundwork for formal music instruction. You’ll join the fun for the final activities and watch as your child begins to master music terms and concepts, boost school readiness and encourage a natural love of learning. Our most advanced classes offer children the opportunity to use music notation to play a variety of instruments. As children grow musically throughout Level 5, they develop strong social-emotional, problem-solving, and pre-literacy skills that help build a strong foundation for learning in other subjects like math, reading, and writing. *Note: Level 5 will not be offered fall 2018.